The Donald’s 757 with its billboard motif has been a nearly continuous fixture on the campaign trail and his S-76 helicopters have also made headlines. Yet there is another aircraft in Trump’s fleet that is seldom seen, a 1997 Citation X with massive logos all over it. The Cessna Citation X is more about utility than expansive luxury and lavish accouterments. 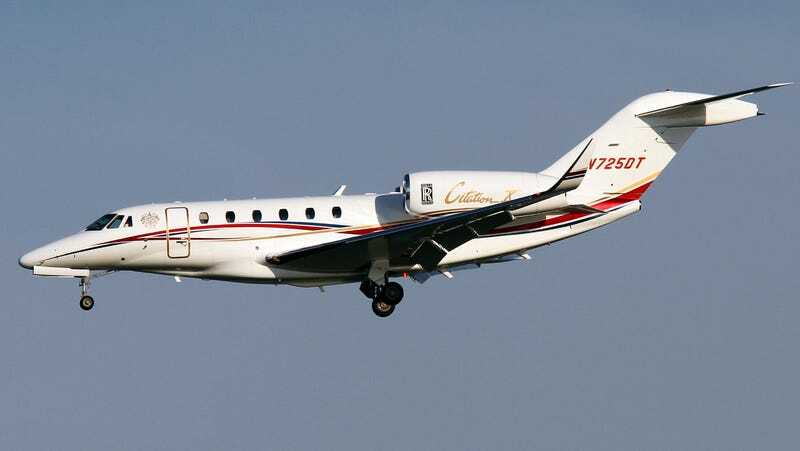 Introduced in 1996 it is known as the fastest business jet in the world, only giving up its crown temporarily to the much more expensive and larger Gulfstream 650 before regaining it again in the guise of the slightly improved Citation X+ model. Although it doesn’t feature bedrooms, large saloons or a shower in its lavatory, the Citation X will take you across oceans at high speed, with the latest models cruising at a whopping 528 knots and as high as 51,000 feet. The inside of the “Ten” is well appointed with the ability to carry between eight and 12 passengers, depending on the layout, in beyond first class comfort. It does all this at the price of around $23 million. That may sound like a ton of money, and it is, but everything is relative in the world of private jets. The larger, much longer-ranged and nearly as fast Gulfstream 650 goes for roughly three times that price. You can also pick up a well cared for used Citation X for well under $10 million, with older models, like Trumps, going for around $3 million. Although there are no publicly available photos (at least definitively authentic ones) of the interior of Trump’s Citation X, in fact even exterior shots are quite rare, the jet’s outward presence is classic Trump. It is covered in badges and its red, black and gold motif maybe stock, but it matches Trump’s much beloved color palette. The jet has had winglets added within the last few years and judging by its registration records, it likely had a makeover inside at the same time. Because everyone has to know, Donald Trump’s Citation X (officially owned by DJT OPERATIONS CX LLC), just like every other ever built, is powered by Rolls Royce-Allison AE 3007C turbofan engines. Hence the massive Rolls Royce logo on the front of the jet’s engine nacelles. A similar, though more tastefully scaled brand pronouncement exists on the engine nacelles of his 757 as well. Just in case the “DT” tailcode is not enough for identifying this jet as belonging to The Donald, the Trump “family crest,” which has no historical significance at all, is emblazoned between the windscreen and the passenger door. In all, there is a lot going on with the exterior paint on this jet, although it is nearly impossible to make the muscular Citation X look ugly. Along with his 757 and pair of S-76 helicopters, the Citation X is a nice fit, and with a born-on date of 1997, it is the youngest aircraft in Trump’s personal air force.